We're really bad at refinishing furniture. This project is taking F.O.R.E.V.E.R. Buy oh boy am I falling in love with it! We've learned so much too. We thought we would save money by buying flat paint in our color choices and then finishing with a top coat of satin polyurethane. Stupid stupid STUPID. If we had just paid a little bit more for satin finish paint, we'd be DONE right now! But it's going to look awesome!! 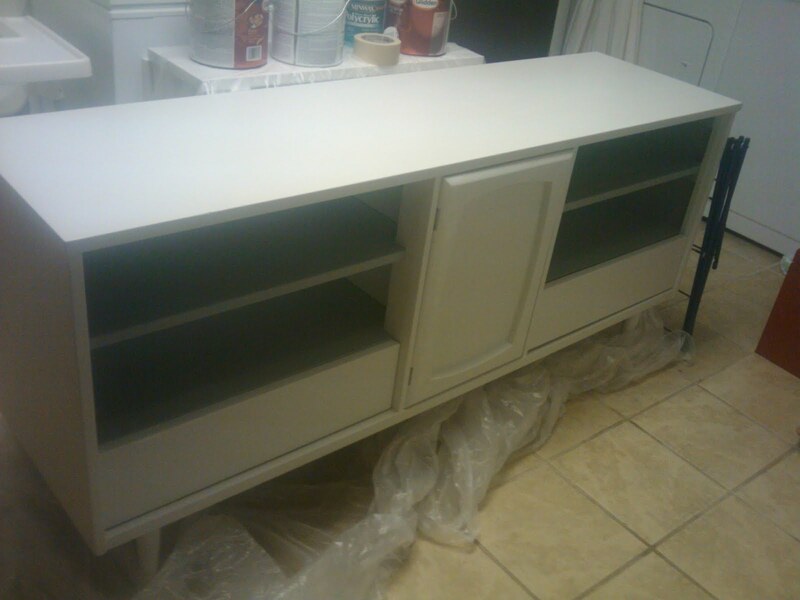 All that is left is to polyurethane the shelves and drawers and then find hardware for the drawers and hinges for the door on the front. Our poor kitchen has been our makeshift garage for the last 3 weeks. I want my kitchen back! Sorry for the blurry cell phone picture! ALSO, I'm trying to get Clint to help me make these side dressers/nightstands for our bedroom next. He's kind of burnt out on painting too. But I love them too much!! Me likey! It looks awesome! Cute! I just found a super cute dresser on the curb for free. It needs a little touch up work and I think I need to sand it down and repaint it. Did you get just regular house paint or is there special furniture paint?